Santana Row is a mixed-use urban environment in the Silicon Valley, with over 1,000 residents, restaurants and luxury retail. Inspired by prestigious European and American mixed residential/shopping districts, Federal Realty Investment Trust (NYSE:FRT) created the ambitious 40 acre community in San Jose. They needed a world-class brand that would grow as an icon for main street living in Silicon Valley. The initial work involved developing a plan to define the identity, positioning and all programs required to launch the brand. This plan was combined with the larger land use proposal and presented to the City of San Jose and Santa Clara County for consideration. 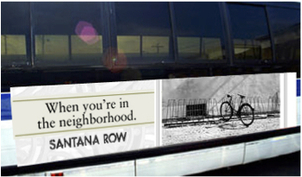 The final brand name “Santana Row” was created to reflect the location’s Spanish heritage on the surrounding region. The name was expanded into a brand identity and standards, applied into collateral, print and broadcast advertising, signage, web promotions and a launch public relations campaign. After the development was approved for building, the brand identity was completed as well as PR and marketing support programs to bring the new neighborhood to life. Santana Row has attracted such notable blue chip tenants as Gucci, Burberry, St. John, Diesel and Tod’s. It continues to represent one of the most successful urban developments in the U.S., as underscored by two major awards, the CELSOC Engineering Excellence Award and Builder Magazine’s Project of the Year.